We fish out of St. Catharine's, Ontario, Canada for King Salmon, Coho Salmon, Steelhead Trout, Lake Trout, and Brown Trout in Lake Ontario. We moved our salmon fishing operations to the Canadian waters a few years back for many reasons; mainly because the fishing is better, by far. There is less competition (fewer anglers), a more liberal limit (5 silver fish compared to three in New York), much cleaner area, better restaurants, very liberal exchange on money, and the local people are much nicer and friendly. April until mid May finds us Spring Salmon fishing for Kings and Coho's. Generally we are within two miles from shore, and sometimes within yards from shore. 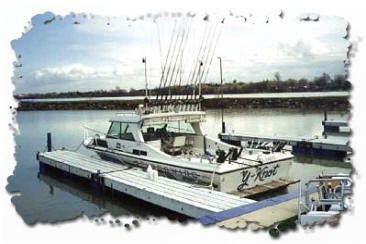 Mid May brings us back to Lorain, Ohio to troll for trophy Walleyes and Smallmouth Bass. Large fish are the norm for this time of year. By the end of June, the Walleyes have moved offshore and are joined by the scrappy, jumping Steelhead Trout. This fishery stays good until the middle of July. In July, we move back to St. Catharine's to fish for big Steelhead Trout and even bigger King Salmon. Limit catches are common with boxes of Steelhead being topped off with a few huge King Salmon. In August and September, the Kings come inshore to prepare to run up the Niagara River to spawn, and that's when you will see the biggest fish of your life scream line off your reel. In mid September, we come back to Lake Erie to fish for migrating Walleyes out of Vermilion, Ohio. Now is when you will see the biggest Walleyes of the year. This fishery lasts until almost December. As you see, we do not stay in one port for the entire year as the fish migrate away. We are obsessed with giving you the best fishing for your hard earned money.